Have you been wanting to be a Therapy Dog Team, but just not sure how to go about it? Or maybe you are not sure what is involved. 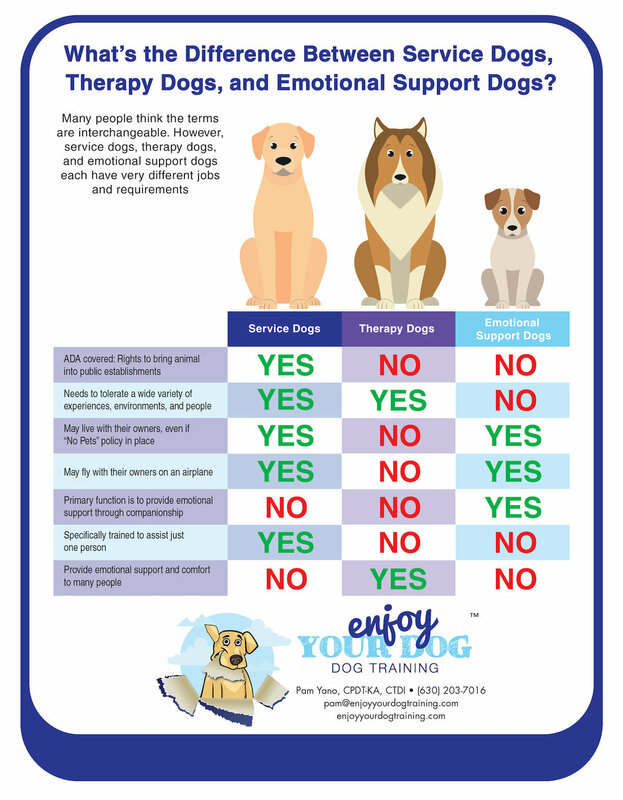 Enjoy Your Dog, Inc. can help you! Before we get started on the Therapy Dog Journey, let’s make sure we all understand the terminology that is often confused. Therapy Dogs, Service Dogs or Assistant Dogs, and Emotional Support Dogs are often confused with each other. The three are VERY different. See our infogram below. The most critical part of becoming a Therapy Dog Team is having a dog with the right temperament. Not all dogs are meant to be a Therapy Dog. This is no different than all children are not meant to be ballerina’s or race car drivers. We all have different gifts and so do dogs. You can review the requirements through Therapy Dog International’s Testing Requirements. DO NOT BE CONCERNED IF YOU FIND THE 13 behaviors to be overwhelming. We can help you! If your dog has the temperament, we can assist you in teaching the skills needed to become a Therapy Dog. Call us at (603) 203-7016 to get started on your journey to becoming a Therapy Dog Team, or use our contact form below. Start your Therapy Dog Journey by signing up for our Therapy Dog Prep Class or Therapy Dog Practice Evaluation.